Winter’s harsh conditions and extreme cold can wreak havoc on a roof. These conditions can manifest into leaks and accelerate roof failures if they are ignored. Repairing problem areas and extending the life of the roof is the very essence of CentiMark’s Preventative Maintenance Program. With a roof leak, there are long lasting negative effects that may take years to detect. Several components or layers between the roof membrane and the building interior can be saturated before the water actually “leaks” in the space below. This means that wet insulation, rotted or rusted roof decking or moldy sheetrock may be problematic. Continued moisture contact with steel, wood, gypsum or other roof decks can cause deterioration that can weaken the deck, resulting in safety concerns and possible structural failure. Wet insulation drastically reduces the R-value of the insulation, promotes mold growth on organic surfaces, increases the weight load on the roof, oxidizes roofing fasteners and components and wreaks havoc on the roof system in general as the water changes from liquid to gas to solid (ice) as the building experiences the changing seasons. Above deck insulation can also compress when wet causing fastener heads to tear through the roof membrane resulting in further leaks. Results of poor roof maintenance are often seen on other components of the building envelope. Damage to brick, stucco, wood or concrete can occur from improper roofing maintenance. Extensive repairs, early roof replacement, lost tenants, damaged building components, decreased energy efficiency, voided warranties and concessions at building sales are just a few problems and expenses that may be caused by inadequate roof maintenance. An annual or semi-annual Preventative Maintenance Program is key to extending the life of a roof. While certain roof damage may be visible at the roof surface, some damage will not be discovered by an untrained eye. A thorough assessment requires an experienced roofer. 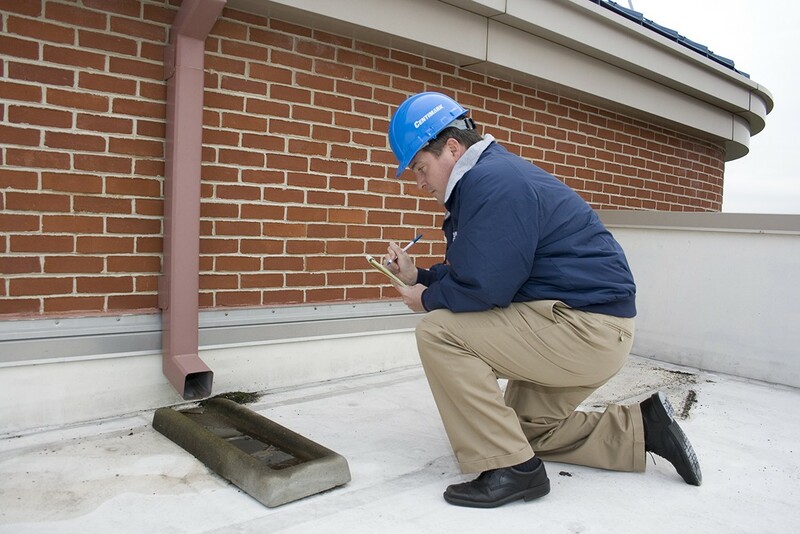 A Preventative Maintenance Program includes inspections and repairs of roof defects associated with drainage, counter flashing, penetrations, membrane conditions and roof accessories. Inspection reports will contain: a detailed roof assessment, photographs, cost-effective roof repair or replacement solutions, a service inspection checklist and suggested safety enhancements. A Preventative Maintenance/Housekeeping Plan costs between .01 to .03 cents per square foot per visit. For every dollar spent on Preventative Maintenance, it is estimated that five dollars is saved through reduced emergency repairs, decreased building interior damage and increased roof life expectancy. The roof life for a roof without a Preventative Maintenance Program is estimated to have a service life of 12 years, drastically reduced from its intended service life of 20 years. Comprehensive Online Roof Management Programs provide detailed information on service and asset management. Roof repair information includes work authorization forms, before/after photos, warranty information, invoices and recommended safety and service enhancements. Budgetary information should assist in prioritizing repairs or re-roofing by providing a life expectancy for each inspected roof section. Proactive Preventative Maintenance Programs help extend the life of roof. Solving roofing problems with long-term planning, energy-efficient technologies and long-term financing will help you weather any financial storms. Advanced roofing technologies may change the way you think about your roof and the costs associated with roofing. Think how you can save money through your roof.